Delays in releasing elderly patients from hospital could continue for up to five years, NHS England boss Simon Stevens has warned. 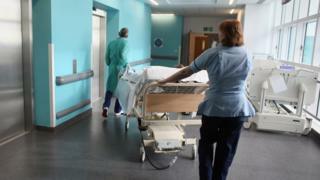 So-called bed-blocking is estimated to cost the service about £820m a year. A recent report by the National Audit Office said delays in discharging patients from hospitals in England had risen by nearly a third over two years. Mr Stevens told MPs the number of blocked beds may not reach zero soon because of social care pressures. Bed-blocking occurs when a patient is deemed medically well enough to be released from hospital, but something else delays their discharge. More than a million days of bed occupancy were lost to other patients last year. The main reasons were delays in getting a home care package or nursing home placement. A senior Department of Health official, John Rouse, also told the public accounts committee there was an unacceptable variation in performance, but that more than 40% of local authorities providing social care had reduced delays. The department has previously said the issue would be tackled as councils get £3.5bn more for adult care by 2020. Across England, the audit office found that for every 100 beds, three days of use were taken by patients who no longer needed to be in hospital between March 2015 and February 2016. It represented a rise of almost one third on the same period two years earlier. Analysis of figures showed 26 trusts where there were at least five days of delayed discharge for every 100 beds in 2015-16. This was out of a total of 148 acute trusts surveyed.